The 21st novel in Susan Wise Bauer's list of fiction reads from her book The Well-Educated Mind is The Trial by Franz Kafka. 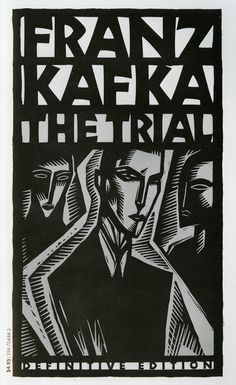 Kafka started working on The Trial in 1914 and the book didn't get published until after his death in 1925. Before he died in 1924, he bequested all his papers and unfinished stories to his best friend and translator, Max Brod and requested all his unpublished works be destroyed. Brod ignored his wishes and went on to publish The Trial in 1925, The Castle in 1926, Amerika in 1927 and The Great Wall of China in 1931. The Trial was never completed but the last chapter does bring the story to a close. Synopsis: A terrifying psychological trip into the life of one Joseph K., an ordinary man who wakes up one day to find himself accused of a crime he did not commit, a crime whose nature is never revealed to him. Once arrested, he is released, but must report to court on a regular basis--an event that proves maddening, as nothing is ever resolved. As he grows more uncertain of his fate, his personal life--including work at a bank and his relations with his landlady and a young woman who lives next door--becomes increasingly unpredictable. As K. tries to gain control, he succeeds only in accelerating his own excruciating downward spiral. Someone must have been telling lies about Josef K., he knew he had done nothing wrong but, one morning, he was arrested. Every day at eight in the morning he was brought his breakfast by Mrs. Grubach's cook - Mrs. Grubach was his landlady - but today she didn't come. That had never happened before. K. waited a little while, looked from his pillow at the old woman who lived opposite and who was watching him with an inquisitiveness quite unusual for her, and finally, both hungry and disconcerted, rang the bell. There was immediately a knock at the door and a man entered. He had never seen the man in this house before. He was slim but firmly built, his clothes were black and close-fitting, with many folds and pockets, buckles and buttons and a belt, all of which gave the impression of being very practical but without making it very clear what they were actually for. "Who are you?" asked K., sitting half upright in his bed. The man, however, ignored the question as if his arrival simply had to be accepted, and merely replied, "You rang?" "Anna should have brought me my breakfast," said K.
He tried to work out who the man actually was, first in silence, just through observation and by thinking about it, but the man didn't stay still to be looked at for very long. Instead he went over to the door, opened it slightly, and said to someone who was clearly standing immediately behind it, "He wants Anna to bring him his breakfast." There was a little laughter in the neighbouring room, it was not clear from the sound of it whether there were several people laughing. The strange man could not have learned anything from it that he hadn't known already, but now he said to K., as if making his report "It is not possible." "It would be the first time that's happened," said K., as he jumped out of bed and quickly pulled on his trousers. "I want to see who that is in the next room, and why it is that Mrs. Grubach has let me be disturbed in this way." It immediately occurred to him that he needn't have said this out loud, and that he must to some extent have acknowledged their authority by doing so, but that didn't seem important to him at the time. That, at least, is how the stranger took it, as he said, "Don't you think you'd better stay where you are?" "I want neither to stay here nor to be spoken to by you until you've introduced yourself." "I meant it for your own good," said the stranger and opened the door, this time without being asked. The next room, which K. entered more slowly than he had intended, looked at first glance exactly the same as it had the previous evening. It was Mrs. Grubach's living room, over-filled with furniture, tablecloths, porcelain and photographs.